Street System - News - Mobile Legends: Bang Bang - Powered by Discuz! it is a new leaderboard system designed for heroes which this time bases the ranking based on the player's current location. The difference between this and the current hero power system is that this actually shows how much points you gain and loss at the same time, this would make players feel a bit more competitive in earning their ranks with the various surprises that is included in this system. 1)Titles- These titles are rewarded every week which players can use for their profile and upon using these titles. It will also be shown whenever you chat in the lobby or group. 2)Rank- Along with the title the players optted to use, their will now be a rank display on the loading screen as well as post-game lobby for players to show off their mastery and dedication for that hero. Basically the street system is something that gives the players some bragging rights at the same time something for players to grind towards to in Mobile Legends. 1)players would need to register their location by going to the leaderboards followed by the Street Section. Then players need to set up their location in order to register, the location will automatically be detected by the game's system to be able to give a more competitive and rewarding feel to players who are highly active in Mobile Legends around that area. 2)After registering players can now gain MMR for the heroes they play in ranked games. The heroes the player uses in their ranked matches after registering in the street system automatically rewards them MMR based on their performance so players don't have to worry about focusing on one hero but it does reward them greatly if they do focus on one hero as they will be able to climb up the ladder and be known for that hero. 3)The street system refreshes every Monday 9pm, GMT+8 wherein after the refresh players who where able to climb up or were pulled down would be given a title corresponding to the rank they earned for the week.They can use these titles until the next refresh for the street system. 4)Lastly players will noticed that there will be a division in terms of the ranking for the street(similar to Global and Local Leaderboards), the street system involves their local town followed by city and then province and]the top leaderboards for the street system. Im just wondering. 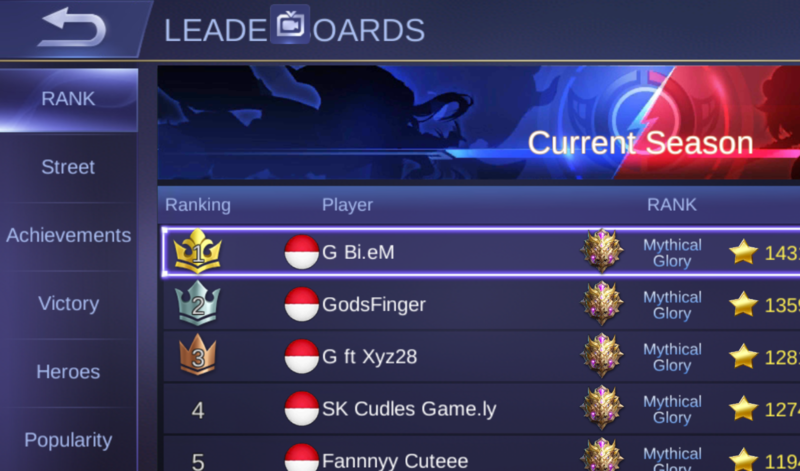 I'm in #2 spot right now in Canada but still i dont have the supreme title? Hmm..
Can you take a screenshot so I can take a better look at the issue? i didn't see Street Section on Leaderboard . I am from Myanmar and i am using with iphone 6s+. 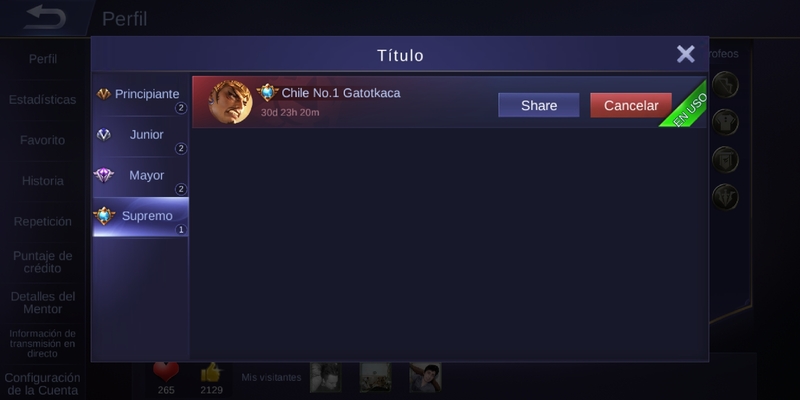 The original post says the rankings refresh every Monday, but I was not given a Supreme title even though I am ranked #6 right now in the USA. Does the Supreme ranking not refresh every Monday? I've downloaded from iTunes store Australia. Device is a 2 week old iPhone Xs. Why would it matter which country I am playing in? Do you guys release different versions/features of the game based on which server a player is connected to? I'm bit confused regards to how you guys set up your server clusters, and how clients(players like me) connect to your servers. We do a lot of network focused analysis here at the company I help run and own, and we can see that when I am playing, I am connecting to an AWS in the U.S.A. So, from a user experience (UX) perspective, this degrades our experience (I buy diamonds), the more and more we feel our money - and more importantly, our limited time alive as human beings go - the more we, well I, would feel this game, community is not worth investing my money nor my finite time. Our company specialises in hosting, networking and web design / portals. I've already sent several emails to do business with Moonton but I haven't heard anything. If it's a cost/commercial thing, my business partner and I would be happy to discuss how it could be arranged, and done really well and quickly. We work using mostly Agile framework. Hope the coin drops and you guys can understand what I am trying to say. Also I uploaded a jpg version of my current client version so it's easier for you guys to have information to trouble shoot. Thanks again for your effort but especially your time. 1)players would need to register their location by going to the leaderboards followed by the Street Section. And yes I have just the other day reinstalled the game.... and did the tutorial. Again. Hi Star, for the street system you should be able to view it just below the global leaderboards as you can see in the screenshot below. And based from your screenshot it seems that you dont have it. Mind telling me what country you are from and what device you are using? *bump* Leaderboard -> Street option is now available in Australia. It looks like they are staging the roll out of this? It's probably a Database thing if it's making their job easier to iron out the bugs?